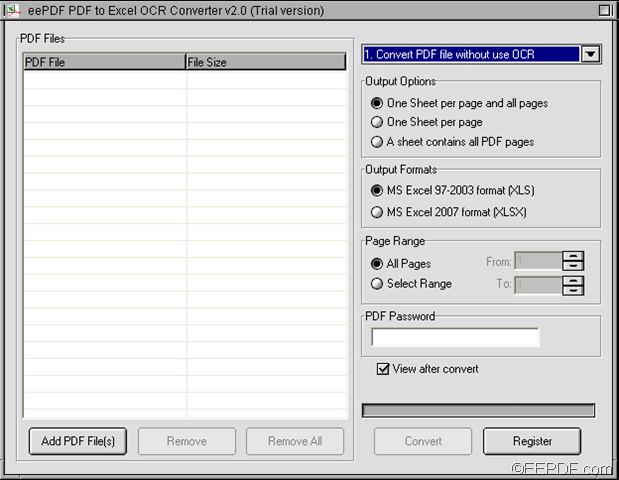 With the help of EEPDF PDF to Excel OCR Converter, you can batch convert scanned PDF to Excel (XLS/XLSX) with OCR technology. If you have plentiful scanned PDF statistical documents and need to perform calculation to the data, manually typing the PDF data into Excel spreadsheets will cost you a lot of time and energy. Fortunately, with EEPDF PDF to Excel OCR Converter, you can convert the read-only scanned PDF to editable and well-formatted Excel spreadsheets in batches with accurate preservation. Please feel free to download installer of this application by clicking the button shown below. Then, please double click the installer and follow setup wizard to install this application in your computer. Click the Add PDF File(s) button at bottom of the user interface and choose PDF documents in the opened file picker window. Directly use drag and drop operations to add the PDF files. To select all the added PDF files in the proceeding list of this application, please press the button Shift on your keyboard, and at the same time click the first and last PDF file in the list. Please see it in the next snapshot. In the drop-down list above the group box of “Output Options”, you can choose an appropriate OCR option so that the application can accurately recognize the texts. In the group box of “Output Options”, you can choose to convert every PDF page to single Excel spreadsheet respectively or all PDF pages to a single Excel spreadsheet. In the group box of “Output Formats”, you can set the output format as to XLS or XLSX. Please click the Convert button at bottom of interface. In the pop-up “Browse for Folder” window, please click the OK button to run the conversion from scanned PDF documents to Excel. Several seconds later, you can view the target files in the specified location. 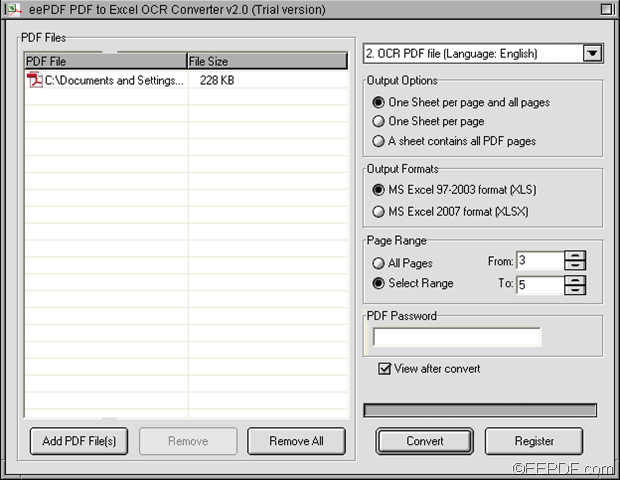 This is the end of this article and you can get full version of EEPDF PDF to Excel OCR Converter here. 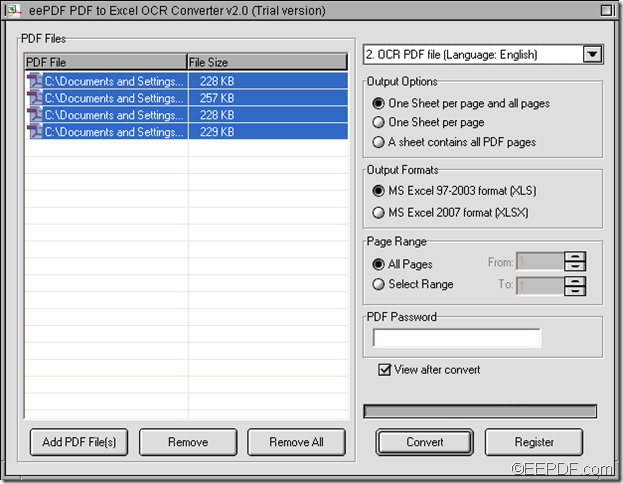 The application EEPDF PDF to Excel OCR Converter enables you to convert selected pages of scanned PDF to Excel (XLS/XLSX) with OCR technology. OCR (Optical Character Recognition) is the electronic translation of scanned images of handwritten, typewritten or printed texts into machine-encoded text, which is widely used to convert books and documents into electronic files. OCR makes it possible to edit the text, search for a word or phrase, store it more compactly, display or print a copy free of scanning artifacts, and apply techniques such as machine translation, text-to-speech and text mining. The built-in OCR technology in EEPDF PDF to Excel OCR Converter allows you to convert English, French, German, Italian, Spanish and Portuguese scanned PDF to editable Excel spreadsheets. It can not only convert plentiful scanned PDF files to Excel in batch, but also can convert selected page range from a scanned PDF file to Excel spreadsheets. In the following contents, it will show you how to use this app convert some partial PDF pages to editable Excel. Firstly, you need to download the app via clicking the following button. After the download, please double-click the installer and follow the setup wizard to install it on the computer. Then, please open this app and add the scanned PDF document into it by clicking the Add PDF File (s) button at bottom of the user interface to open file picker window in which you can choose PDF document. Thirdly, according to the language in the scanned PDF file, please choose a suitable OCR in the drop-down list above the “Output Options” group box. Then, please check the radio button of “Page Range” and input the start page number and end page number in “From” edit box and “To” edit box respectively. Please see it in the next snapshot. Before the conversion, you can also set reconstruction mode in “Output Options” group box and output format in “Output Formats” group box. Lastly, please click Convert button at bottom of the interface. In the opened “Save As” window, please specify the output location and file name for the target file, and then click the Save button to start to convert the scanned PDF document to Excel. This is the end of this article and you can enjoy the full version after you buy EEPDF PDF to Excel OCR Converter. Do you want to fix some errors or perform calculation, etc. in read-only scanned PDF tables? 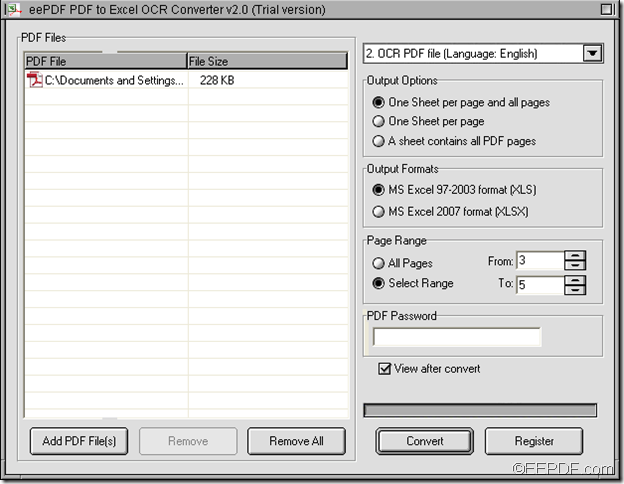 If so, you can use EEPDF PDF to Excel OCR Converter to help you. It is a powerful OCR application that can extract data from scanned PDF to editable Excel (XLS/XLSX) spreadsheets with easy operations. 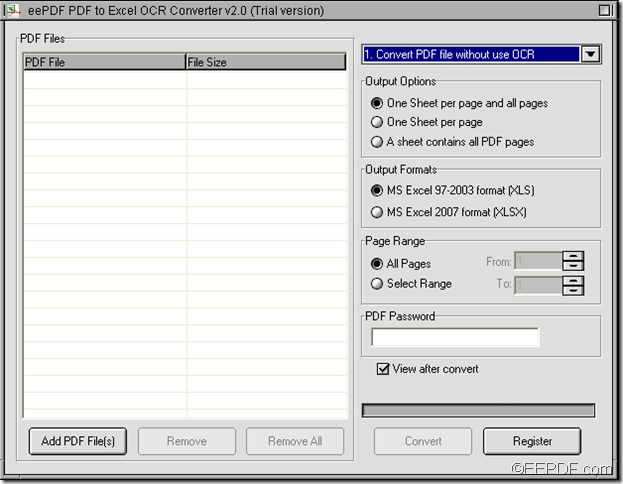 Please download the free trial version of EEPDF PDF to Excel OCR Converter via clicking the button shown below. When you complete the download, please double-click the installer and follow the setup wizard to install it on the computer. During the setup, please allow it to create a shortcut on the desktop for your use convenience. After the download, please open this application via double-clicking the short icon of this application on the desktop. Then, you can see the application interface on the screen as shown in the next snapshot. In order to add scanned PDF document(s), you can click button Add PDF File (s) at bottom of the interface to open file picker window in which you can choose PDF document(s). Or you can directly use drag and drop operations to add the PDF document(s). In the drop-down list above the “Output Options” group box, please choose an appropriate OCR option based on the language in the scanned PDF files. In “Output Options” group box, you can choose to convert each PDF page to single Excel spreadsheet respectively or all PDF pages to a single Excel spreadsheet or both of them. In “Output Formats” group box, you can choose to convert the scanned PDF to XLS or XLSX. To start the conversion, please click button Convert at bottom of the interface. Then, the “Save As” window will pop up, please specify the output location and file name for the target file, and then click the Save button to run the conversion from scanned PDF to editable Excel. With EEPDF PDF to Excel Converter, you can easily convert read-only PDF to editable Excel (XLS/XLSX) spreadsheets. PDF (Portable Document Format) is a popular file format for storing and sharing data with friends, colleagues, business partners, etc. However, it is a hassle if there is need to modify the data in PDF tables, such as fix some errors or perform calculation, etc. EEPDF PDF to Excel Converter is a program to solve the problems. It can quickly and accurately convert PDF documents to Excel spreadsheets. At first, please click the following button to download this software. Then, please double-click the downloaded file and follow the setup wizard to install it on the computer. For your use convenience, please allow it to create a shortcut on the desktop so that you can directly double-click the shortcut icon to quick launch it. After launching the software, you can see the user interface of this application on the screen. Please see it in the next snapshot. Via clicking the Add PDF File (s) button at bottom of the user interface, you can open file picker window and add PDF document(s) from it. Via clicking the Remove button, you can delete the selected PDF documents. Via clicking the Remove All button, you can clear all the added PDF documents. In “Output Options” group box on the right side of the user interface, you can choose to convert every PDF page to single Excel spreadsheet respectively or all PDF pages to an Excel spreadsheet. In “Output Formats” group box, you can choose to convert the PDF document to XLS or XLSX format. In “Page Range” group box, you can choose to convert the whole PDF document to Excel or selected PDF pages to Excel. In “PDF Password” edit box, you can input the password if the PDF is password protected. At last, please click the Convert button at bottom of the user interface. In the pop-up “Browse for Folder” window, please choose an output location and click the OK button to start the conversion from read-only PDF to editable Excel. This is the end of this article and you can get full version of EEPDF PDF to Excel Converter here. 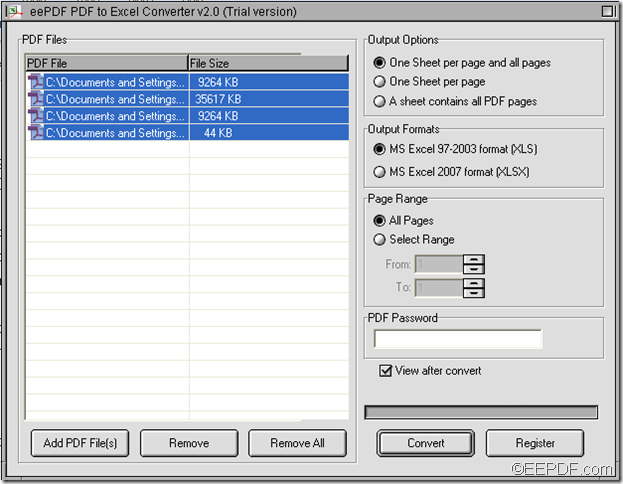 The Windows application EEPDF PDF to Excel Converter allows you to batch convert Adobe PDF to Excel (XLS/XLSX) spreadsheets with easy operations. If you have numerous PDF statistical documents and want to perform calculations and statistical analyses of the data, it’s time-consuming and will cramp your fingers to manually type the PDF into Excel spreadsheets one by one. However, with the help of EEPDF PDF to Excel Converter, you can convert PDF to editable Excel spreadsheets in batches with accurate preservation. To know how to use this application to batch convert several PDF to editable and well formatted Excel spreadsheets, please follow the following steps. At first, you need to click the following button to download this software. When you complete the download, please double-click the setup file and follow the setup wizard step by step to install this software on your computer. During the installation, you can also allow it to create a shortcut on the desktop for your use convenience. After you finish the installation, you can open the software and add PDF documents into it. To add PDF documents, you can click the Add PDF File (s) button at bottom of the interface to open file picker window in which you are able to choose PDF documents. To save time, you can also directly use drag and drop operations to add the PDF files. In order to batch convert the added PDF documents to Excel, please select all the added PDF files by pressing Shift button on your keyboard, and at the same time clicking the first and last PDF file. Please see it in the next snapshot. Before the conversion, you can choose to convert each PDF page to single Excel spreadsheet respectively or convert all PDF pages to a single Excel spreadsheet in “Output Options” group box. You can also set the output format in “Output Formats” group box and page range in “Page Range” group box. At last, please click the Convert button at bottom of interface to convert the PDF documents to Excel (XLS/XLSX) spreadsheets. In the pop-up “Browse for Folder” window, please click the OK button to run the conversion. Note: The trial version can only convert the first two pages of PDF to MS Excel document. 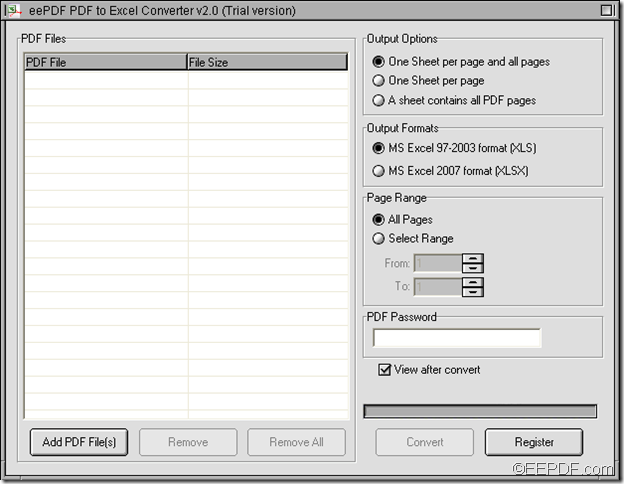 To remove this limitation, please buy the full version of EEPDF PDF to Excel Converter.